The chalkboard paint strikes again...yes, we're still on the same quart-size can that got me through at least a dozen other craft and DIY projects. This time it was used for a little heartfelt gift for a dear friend! First, the backstory: I found a pretty little frame while visiting an antique store up in Portland, Maine last year. Problem was...it had a not-so-pretty knock-off Renior portrait of a lady in it. I hung it in my Curated Powder Bath for a while to play up the crazy decor theme of "let's keep them guessing". 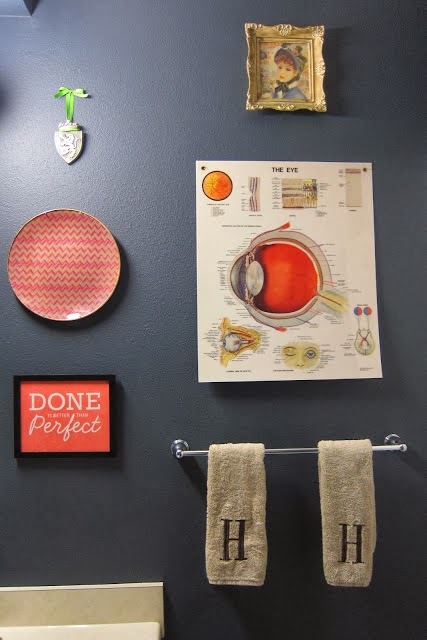 But, after a while she started to look a little creepy staring down at the unassuming powder bath occupant, so I removed the frame from the wall and put it aside in my "to be crafted into something else" stash....and there she sat waiting for several months. Just the other day, having not used my chalkboard paint in a while (ok, a long two months), I decided to bust it out and cover up the faux-Renoir. After a few coats of paint, it was "hello, matte beautiful chalkboard finish"!! I wrote out a verse with chalk that reminded me of my sweet friend...and voila! A pretty little chalkboard was born. Much better than the blue bonnet lady, huh? Moral of the story, you ask? Don't pass by a pretty frame at the thrift store regardless of what it's framing...with a little chalkboard paint it can become something beautiful! LOL! I kinda liked little bo peep. ;0) I wouldn't be mad about a wall art regift!